On health care, President Bush says he stands with the doctors and Americans who are struggling to find affordable medical services. 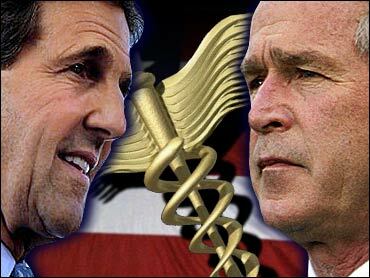 Democrat John Kerry says Mr. Bush has stood idle as medical bills have skyrocketed during his presidency. While Mr. Bush leads Kerry in the polls when voters are asked who would keep the country safe, the president's poll numbers aren't as favorable when it comes to domestic matters. A recent Associated Press-Ipsos poll found 51 percent of registered voters disapproving of how Mr. Bush is handling such issues as health care, education and the environment. It's health care that Mr. Bush was to stress Monday in Muskegon, Mich., a Democratic stronghold that is the first of a three-stop bus tour through Michigan. Mr. Bush also was to visit Holland, Mich., where voters are more supportive of Republican candidates, and Battle Creek, Mich., a swing area of the state that Mr. Bush lost to Al Gore in 2000. Mr. Bush also plans to visit Colorado, arriving in the Denver area late Monday and appearing at a campaign rally at Coors Amphitheater, formerly Fiddler's Green, in Greenwood Village on Tuesday morning. "He'll (Bush) focus on his vision for strengthening health care, versus John Kerry's view of putting government in charge and shifting the costs to taxpayers after the government has been put in charge," Mr. Bush campaign spokesman Scott Stanzel said Sunday. Mr. Bush says small businesses ought to be allowed to pool resources to buy health insurance at discounts available to large companies. He also favors expanding health saving accounts and plans to propose a tax credit to help poor families and individuals to buy health coverage. Further, he wants to ensure that each of America's poorest communities has a health center to serve the underprivileged. In addition, Mr. Bush has called for a medical liability overhaul that will speed damages to those injured through malpractice and help keep insurance premiums within the reach of good doctors. He rarely misses an opportunity on the campaign trail to note that Kerry's running mate, Sen. John Edwards, who earned millions as a trial attorney before turning to politics. Kerry worked last week to turn the campaign focus to health care issues. At a round-table discussion in Des Moines, Iowa, he cited a new report showing a double-digit increase in insurance premiums for the fourth year in a row. He also noted that monthly premiums for the part of Medicare that pays for doctor visits and most other non-hospital expenses is going up 17 percent. Kerry says he wants to help more businesses offer health care by requiring the federal government pick up 75 percent of catastrophic health care costs, a plan that his campaign estimates will lower premiums by an average of 10 percent. The Massachusetts senator would give small businesses a tax credit to help them bear the cost of health insurance. He also wants to let Americans purchase lower cost drugs from Canada. The administration has been studying drug importation, but Senate Majority Leader Bill Frist, R-Tenn., said last week it will not likely come up for a vote in the Senate this year. Hitting another domestic theme on Monday, Kerry is criticizing Mr. Bush for letting a decade-long ban on assault weapons expire while unveiling his own $5 billion plan to fight crime and picking up a police union endorsement. "George Bush made a choice today," the president's Democratic challenger said in remarks prepared for a Washington audience Monday. "He chose his powerful friends in the gun lobby over the police officers and the families he promised to protect." Republican leaders in Congress said last week they have no plans to renew the 1994 ban on 19 types of military-style assault weapons, even as some law enforcement officials encouraged them to keep the prohibition alive. Mr. Bush said he would sign the ban if Congress passed it, but would not press lawmakers to act. Bush-Cheney campaign spokesman Steve Schmidt said, "Senator Kerry has spent his entire 20-year career in the U.S. Senate fighting against Second Amendment rights." Kerry also faulted Mr. Bush for proposing deep cuts to the Community Oriented Policing Services program, known as COPS, which the Massachusetts senator pushed to passage 10 years ago. The program provides grants to state and local agencies to hire police officers. Mr. Bush proposed cutting it from $482 million to $97 million next year. On Sunday, the Justice Department said the nation's crime rate last year held steady at the lowest levels since the government began surveying crime victims in 1973, the latest in a decade-long trend showing violent crime falling. Meanwhile, a group of Democratic insiders that has spent some $40 million on advertising against Mr. Bush is rolling out new campaign commercials telling urban blacks "don't keep getting played" and accusing the president of turning his back on them. "Bush has a plan for America. But you're not part of it," says one television ad being released Monday. Another claims: "Bush said prosperity was right around the corner, but he wasn't talking about the corners in your neighborhood." The Media Fund plans to spend a relatively large amount for minority media — about $5 million between now and Nov. 2 — on television, radio and print ads, mostly in presidential battlegrounds of Florida, Michigan, Minnesota, Missouri, Ohio, Nevada, Pennsylvania and Wisconsin. Schmidt, the Bush campaign spokesman, called the ads "divisive and baseless," and said they are "produced from a position of weakness."